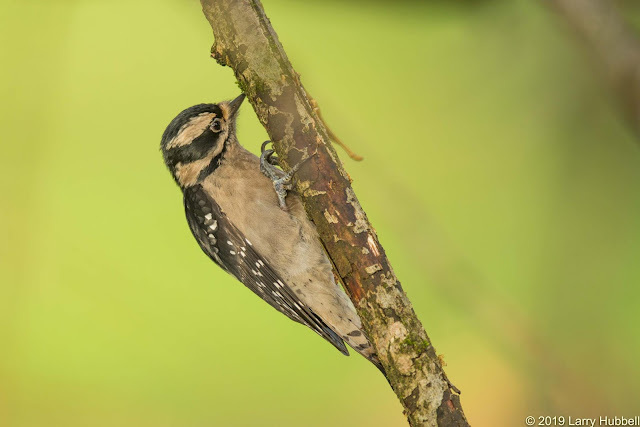 How do we know this is a female Downy Woodpecker? 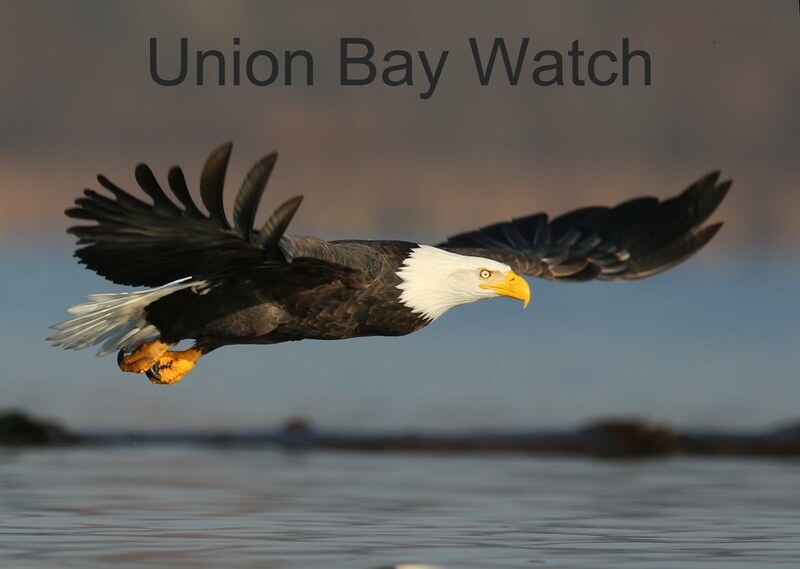 By winter, the variety of smaller bird species around Union Bay has declined. Luckily, nature compensates birdwatchers by removing the leaves from deciduous trees. 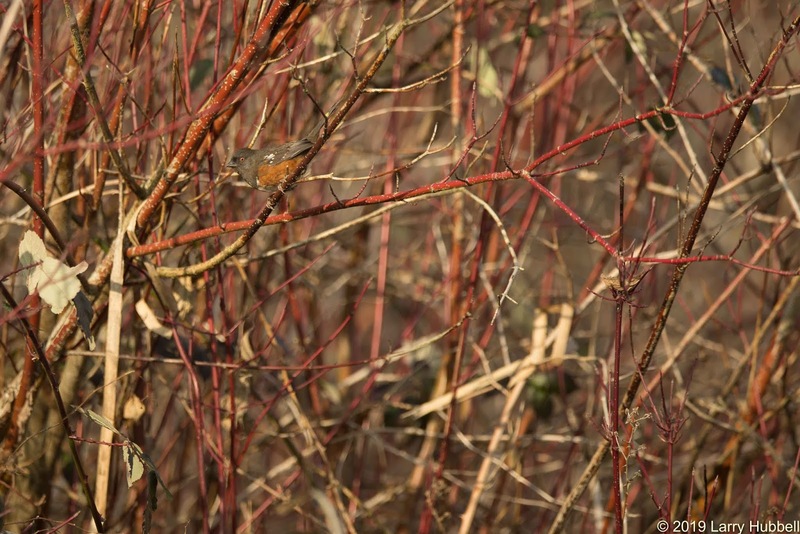 Leafless branches provide a few more opportunities to see our non-migratory resident birds. None the less, quick little birds can be easily overlooked. A Bewick's Wren inspects the moss and lichen for tasty miniature lifeforms. 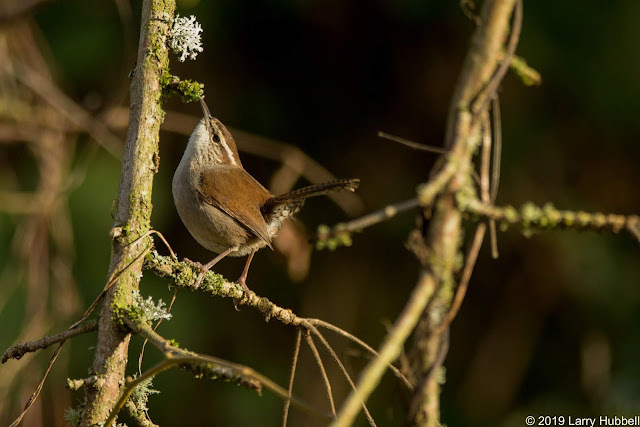 During short, sunlit days hungry birds can become more active and somewhat easier to see. We know this is a male Downy Woodpecker due to the small red spot on the back of his head. This Downy Woodpecker decided to hop along the top of the log while prospecting for nuggets of nutrition. 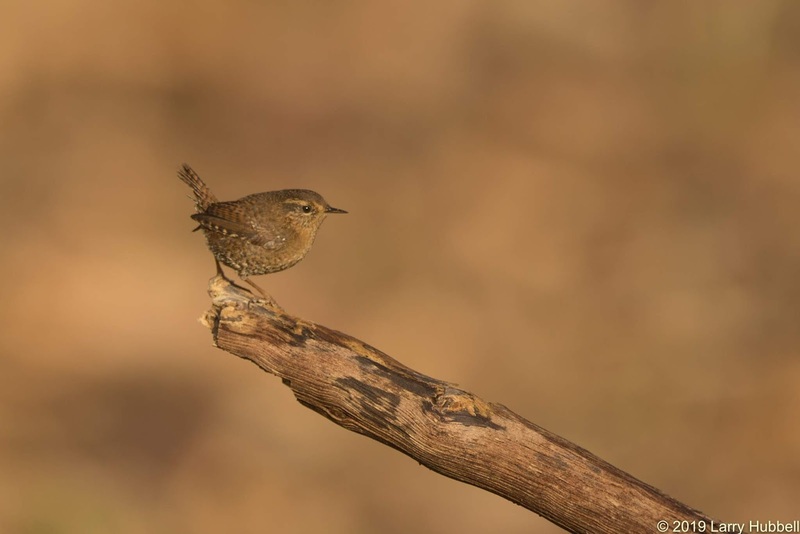 It must have taken at least ten minutes before this nervous little Pacific Wren decided it was safe to sneak out of the leaf litter and enjoy a brief moment in the sun. However, the moments when small birds sit motionless, out in the open, in direct sunlight are the exception not the rule. More often, little birds search for food under leaf litter, in and around fallen logs or among the branches and twigs of small bushes and trees. The intervening foliage often obscures our view. Their fast flickering motions can make them hard to track even when they are in plain sight. 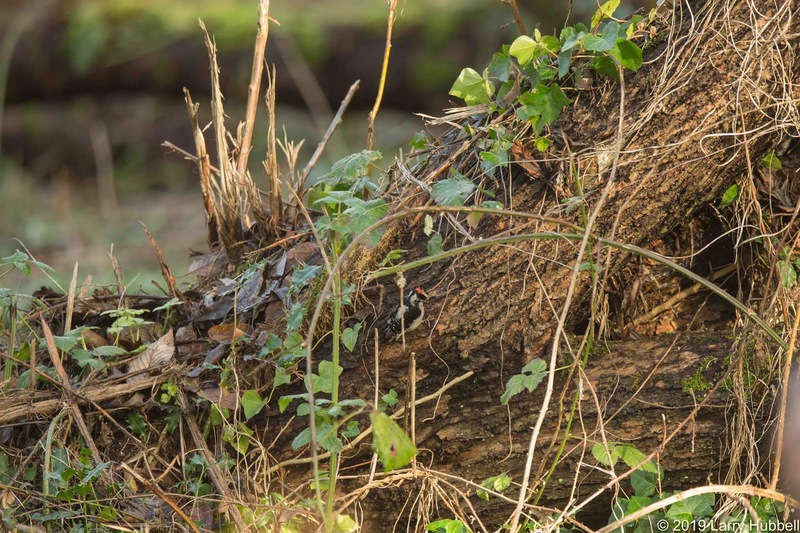 Here are a few examples of how small birds can be easily overlooked. The Downy Woodpecker in this photo can be a bit difficult to see even with its red, white and black coloring. Even more challenging is a little brown wren. Especially, since it has turned its tail toward the camera. It is almost perfectly in the middle of the photo. Often, when I glance down at a setting on my camera and then try to look up and continue photographing a small bird I can no longer find it - even when the bird has not have moved at all. Can you spot the Towhee in this photograph? 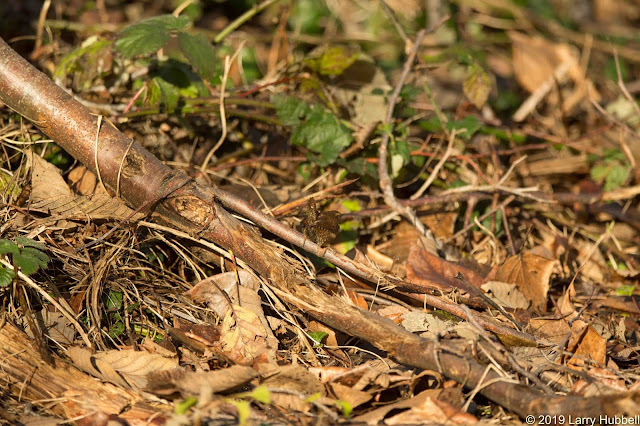 Being easy to overlook is a critical survival skill for small birds. Predators are constantly searching for an easy meal. 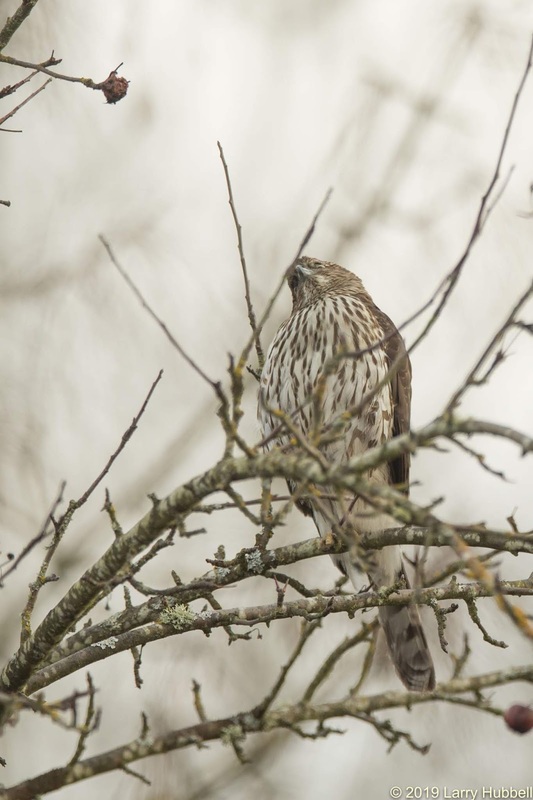 For example, on Friday, this young Cooper's Hawk leaped up from the ground and perched on this small branch in the Union Bay Natural Area. It sat, watching every little movement, for nearly a half an hour. I suspected it had recently fed. Nearby, a Dark-eyed Junco sounded a warning to all who would listen. 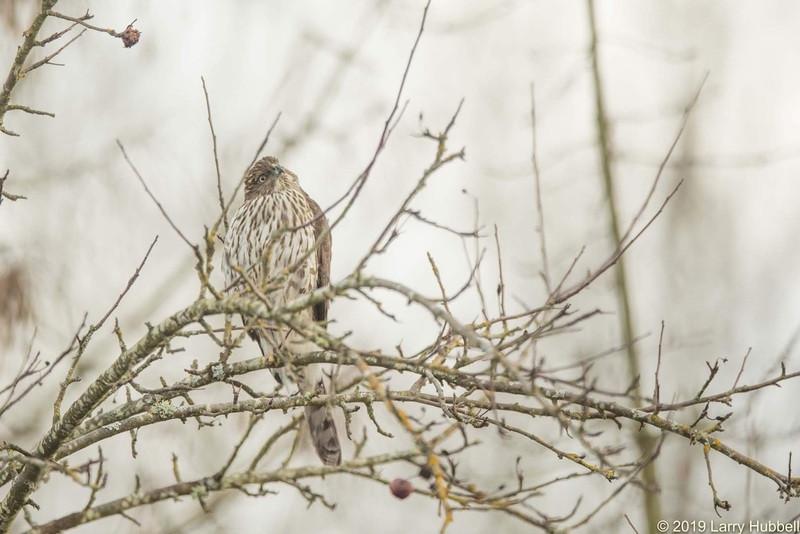 Cooper's Hawks usually weigh less than a pound. 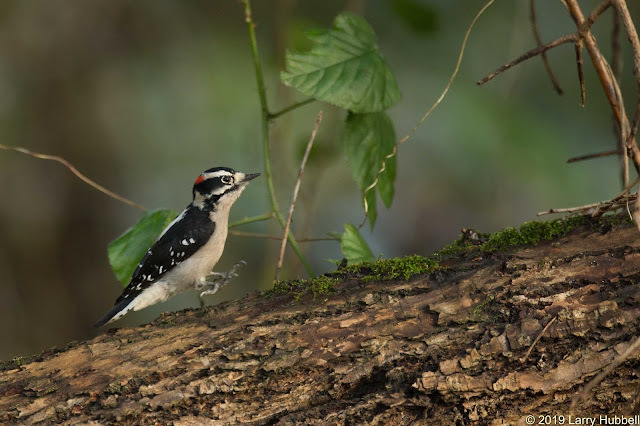 They are not the smallest, and certainly not the largest of predatory birds, however, they are perfectly-sized to hunt small songbirds and little woodpeckers. Given its relatively small size, Cooper's Hawks must also be aware of larger predators. Turning its head sideways allows a better view of any potential danger in the sky. 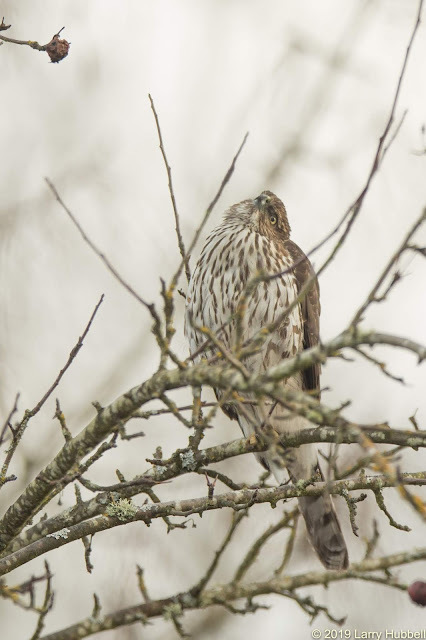 From this angle, it looks like the Cooper's Hawk has a partially full crop. The 'neck' area just below the head looks slightly swollen with food. 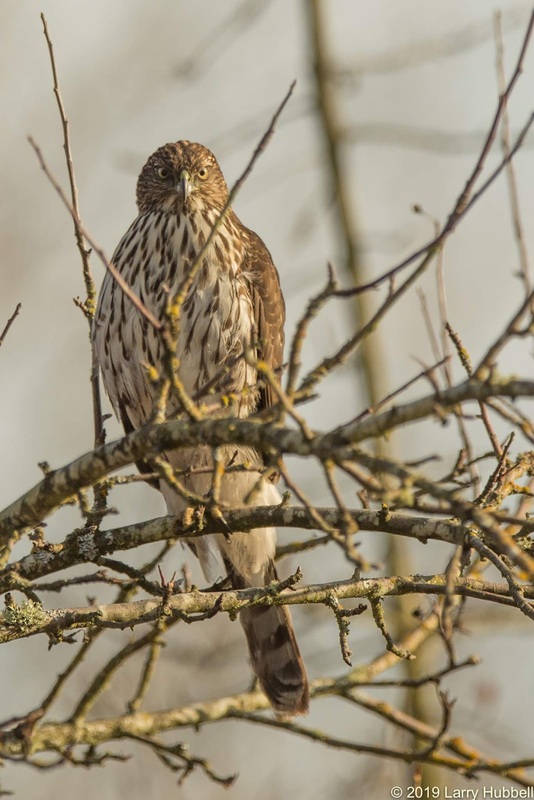 Vertical stripes on the chest of a Cooper's Hawk indicate it is a young bird. Even though it is not yet fully mature Cooper's Hawks sometimes mate and attempt to raise young before they get the horizontal barring which indicates maturity. I wondered what the young hawk was watching. Was there a larger predator in the area? 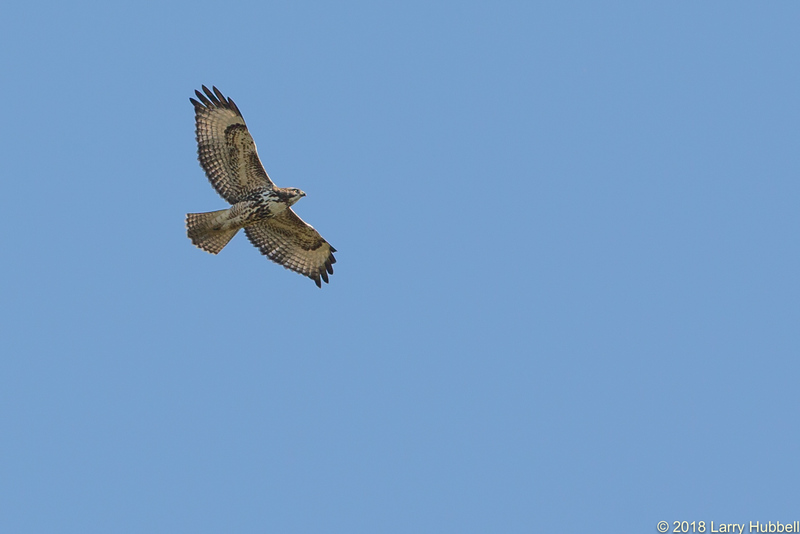 We were very close to the location where I spotted this Red-tailed Hawk in early November. I wondered if the Cooper's Hawk had its eye on a distant Red-tailed Hawk circling overhead. 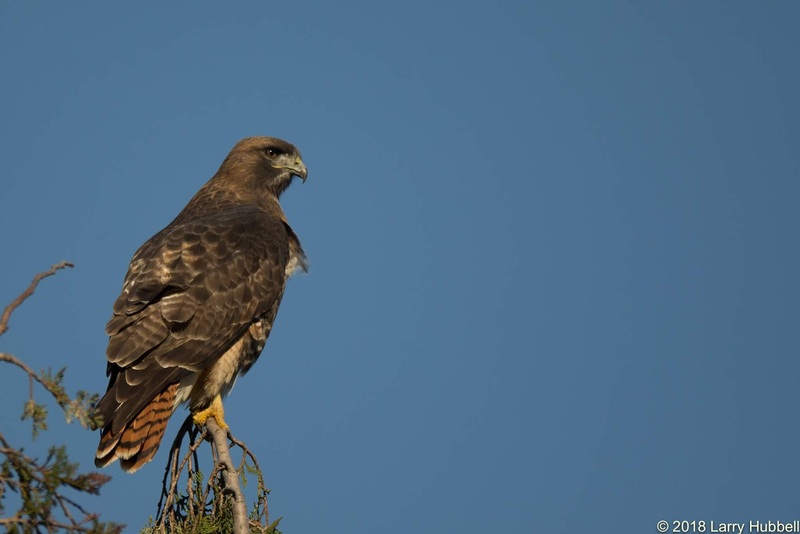 Red-Tailed Hawks can easily weigh three or four times as much as a Cooper's Hawk. Later on Friday, I spotted this immature Bald Eagle looking down from a perch in a Cottonwood Tree on the eastern side of the Union Bay Natural Area. 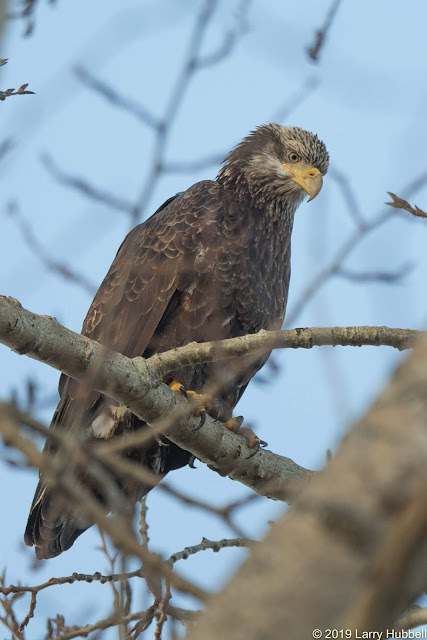 Red-tailed Hawks do not have much to fear from Cooper's Hawks, but they must watch out for Bald Eagles. 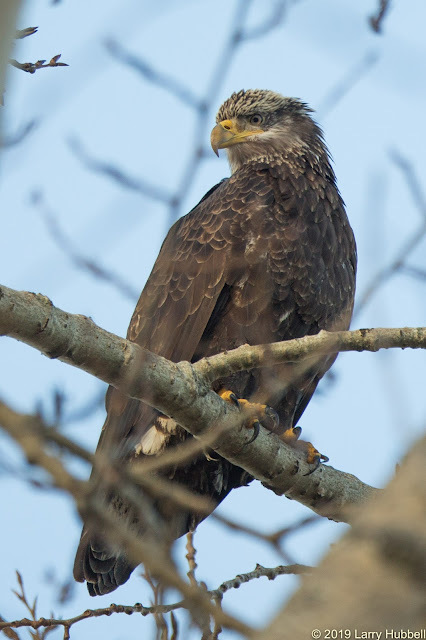 Eagles can easily weigh three or four times as much as a Red-Tailed Hawk. It is interesting to note that the perches, which these predatory birds used, increased in elevation in proportion to the bird's weight. The Cooper's Hawk was about 10 feet above the ground, the perched Red-tailed Hawk was approximately 25 or 30 feet in the air, while the Bald Eagle was probably 60 to 70 feet above the ground. When predators pick off smaller birds its like filtering out the gene pool. As a result, the smaller birds who survive, keep getting faster, their camouflage keeps getting better which makes them even easier for us overlook. One way to spot the smaller birds is to follow the gaze of a larger predator. Predatory birds look over everything while overlooking almost nothing. ps: The Spotted Towhee was in the upper left quadrant of the earlier photo. Also, the female Downy Woodpecker has no red on her head. 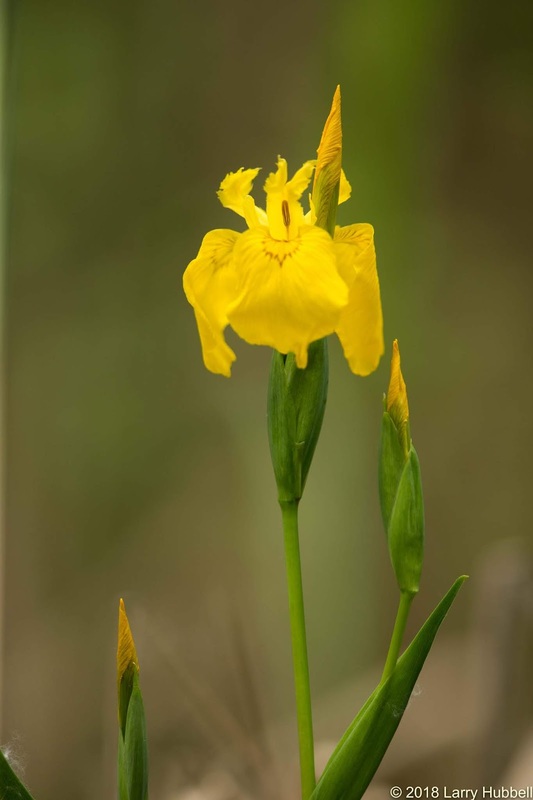 Yellow Flag Iris: A noxious week in Washington. Click on the highlighted name to learn more.